A chromophore is the part of a molecule responsible for its color. The color that is seen by our eyes is the one not absorbed within a certain wavelength spectrum of visible light. The chromophore is a region in the molecule where the energy difference between two separate molecular orbitals falls within the range of the visible spectrum. Visible light that hits the chromophore can thus be absorbed by exciting an electron from its ground state into an excited state. In biological molecules that serve to capture or detect light energy, the chromophore is the moiety that causes a conformational change of the molecule when hit by light. Chemical structure of beta-carotene. The eleven conjugated double bonds that form the chromophore of the molecule are highlighted in red. In the conjugated chromophores, the electrons jump between energy levels that are extended pi orbitals, created by a series of alternating single and double bonds, often in aromatic systems. Common examples include retinal (used in the eye to detect light), various food colorings, fabric dyes (azo compounds), pH indicators, lycopene, β-carotene, and anthocyanins. Various factors in a chromophore's structure go into determining at what wavelength region in a spectrum the chromophore will absorb. Lengthening or extending a conjugated system with more unsaturated (multiple) bonds in a molecule will tend to shift absorption to longer wavelengths. Woodward-Fieser rules can be used to approximate ultraviolet-visible maximum absorption wavelength in organic compounds with conjugated pi-bond systems. Some of these are metal complex chromophores, which contain a metal in a coordination complex with ligands. Examples are chlorophyll, which is used by plants for photosynthesis and hemoglobin, the oxygen transporter in the blood of vertebrate animals. In these two examples, a metal is complexed at the center of a tetrapyrrole macrocycle ring: the metal being iron in the heme group (iron in a porphyrin ring) of hemoglobin, or magnesium complexed in a chlorin-type ring in the case of chlorophyll. The highly conjugated pi-bonding system of the macrocycle ring absorbs visible light. The nature of the central metal can also influence the absorption spectrum of the metal-macrocycle complex or properties such as excited state lifetime. The tetrapyrrole moiety in organic compounds which is not macrocyclic but still has a conjugated pi-bond system still acts as a chromophore. Examples of such compounds include bilirubin and urobilin, which exhibit a yellow color. An auxochrome is a functional group of atoms attached to the chromophore which modifies the ability of the chromophore to absorb light, altering the wavelength or intensity of the absorption. 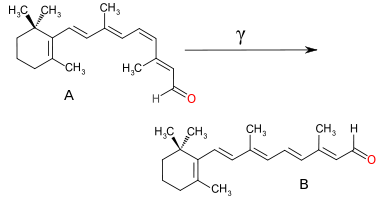 In a pH range of about 0-8, the molecule has three aromatic rings all bonded to a tetrahedral sp3 hybridized carbon atom in the middle which does not make the π-bonding in the aromatic rings conjugate. Because of their limited extent, the aromatic rings only absorb light in the ultraviolet region, and so the compound appears colorless in the 0-8 pH range. However, as the pH increases beyond 8.2, that central carbon becomes part of a double bond becoming sp2 hybridized and leaving a p orbital to overlap with the π-bonding in the rings. This makes the three rings conjugate together to form an extended chromophore absorbing longer wavelength visible light to show a fuchsia color. At pH ranges outside 0-12, other molecular structure changes result in other color changes; see Phenolphthalein for details. Causes of Color: physical mechanisms by which color is generated.